According to Apple, the glass used for its new iPhone 8 and iPhone 8 devices is the most durable glass ever used in a smartphone, but that hasn't helped the device resist shattering in a series of drop tests. SquareTrade, a company that provides extended warranties for electronic devices, conducted drop tests on the iPhone 8, iPhone 8 Plus, and, for comparative purposes, the Galaxy Note 8, which also has a glass body. Both of the iPhone 8 models and the Galaxy Note 8 shattered on all sides in every single drop test, including front and back drops at a distance of six feet, a 22-foot shot drop test, and a tumble test. Each test was conducted using the same equipment. 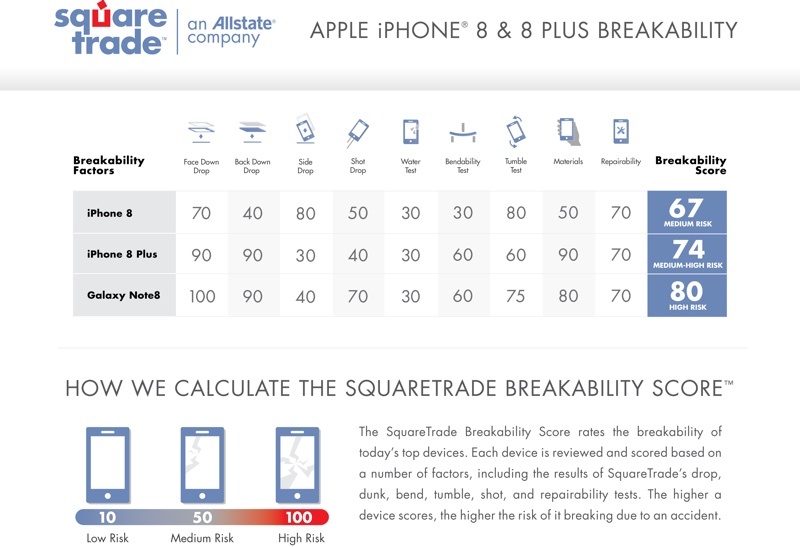 Ultimately, Square Trade gave the iPhone 8 a breakability score of 67, the iPhone 8 Plus a breakability score of 74, and the Galaxy Note 8 a breakability score of 80. At 67 and 74, iPhone 8 and 8 Plus are at "medium risk" of breakage from a drop, while the Galaxy Note 8 is at "high risk." The Galaxy Note 8 fared worse because it was non-functional after some of the tests, while the iPhone 8 and 8 Plus remained usable despite the broken glass. YouTuber JerryRigEverything also did a drop test on the iPhone 8 in a case and without a case. It survived a drop from knee height and was okay after one fall from waist height because it landed on the aluminum frame, but the glass broke after a second waist-high drop. The iPhone 8 in a case unsurprisingly fared better. Another YouTube drop test that compared the iPhone 8 Plus to the iPhone 7 Plus, and the iPhone 8 Plus shattered on the first drop. The iPhone 7 Plus survived a drop on its back, of course, as it has an aluminum body. Drop tests are never scientific and are not a reliable measure of durability because of the many variables involved when a device is dropped, but it's clear that even with the most durable glass used in a smartphone, the iPhone 8 and iPhone 8 Plus are more prone to catastrophic breakage than previous-generation iPhones. While both sides of the iPhone 8 and iPhone 8 Plus are now made of glass, the display and the body don't appear to share the same repair costs, so if you drop it on the wrong side, it's going to be an expensive fix. With AppleCare+, Apple charges $29 for replacement for a broken display, but a broken glass body is subject to the $99 "other damage" repair fee rather than the screen replacement fee. Sans AppleCare+, a display repair for the iPhone 8 costs $149 and an "other damage" repair costs $349. iPhone 8 Plus repairs are even more expensive at $169 for the display and $399 for the body. Apple is also charging more for its AppleCare+ plans this year, with AppleCare+ for iPhone 8 priced at $129 and AppleCare+ for iPhone 8 Plus priced at $149. AppleCare+ covers two incidents of accidental damage. Steve Jobs would have never let glass shatter. Yeah, I'll trust that glass breaks. I'm not clicking on these videos to give these idiots YouTube revenue. This just in... glass breaks. gee...squaretrade that sells accidental insurance advertises what would happen if you dropped an iphone 8? totally unbiased for sure. Wow, this is big, really big. Dropping electronics can cause them to break. And I was just about to drop my tv from 6 feet. While both sides of the iPhone 8 and iPhone 8 Plus are now made of glass, the display and the body don't appear to share ('https://www.theverge.com/circuitbreaker/2017/9/22/16350422/iphone-8-plus-glass-back-repair-cost-applecare') the same repair costs, so if you drop it on the wrong side, it's going to be an expensive fix. With AppleCare+ ('https://www.apple.com/support/products/iphone.html'), Apple charges $29 for replacement for a broken display, but a broken glass body is subject to the $99 "other damage" repair fee rather than the screen replacement fee. Sans AppleCare+ ('https://support.apple.com/iphone/repair/service/pricing'), a display repair for the iPhone 8 costs $149 and an "other damage" repair costs $349. iPhone 8 Plus repairs are even more expensive at $169 for the display and $399 for the body. Apple is also charging more for its AppleCare+ plans this year, with AppleCare+ for iPhone 8 priced at $129 ('https://www.apple.com/shop/product/S6357LL/A/applecare-for-iphone-8-iphone-7-and-iphone-6s') and AppleCare+ for iPhone 8 Plus priced at $149 ('https://www.apple.com/shop/product/S6362LL/A/applecare-for-iphone-8-plus-iphone-7-plus-and-iphone-6s-plus'). AppleCare+ covers two incidents of accidental damage. We must be dropping it wrong. Really? You drop a glass phone on concrete and it breaks and that's surprising… These are the same people that need to know which end of the gun to point down range. Shattered from 6 Feet! Those NBA players all better get cases. The outpouring of sarcasm here is ripe, maybe rightfully so, but there is value in this information. For parents who are buying their teenager a phone that will almost certainly be dropped this information could be helpful, especially if the only info they’ve gotten is from Apple saying this is the strongest glass ever.